The 7I37TA is an 8 output, 16 input isolated I/O card. The 7I37TA provides 8 Isolated 48VDC 1A output drivers. All output drivers are low saturation voltage MOSFETS for low power dissipation. Each of the 8 output switches is isolated from the others, allowing high side, low side, push-pull and other output switch configurations. The 16 opto isolated inputs will operate with input voltages from 5 to 24 V. Reverse protection diodes are provided to allow use with AC inputs. 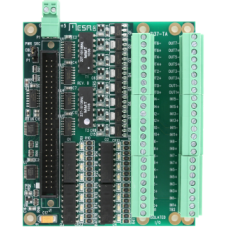 The 7I37TA is compatible with the 4I24M, 4I24H, and all 50 pin connector Anything I/O cards. The -TA version includes 3.5mm pluggable screw terminals.